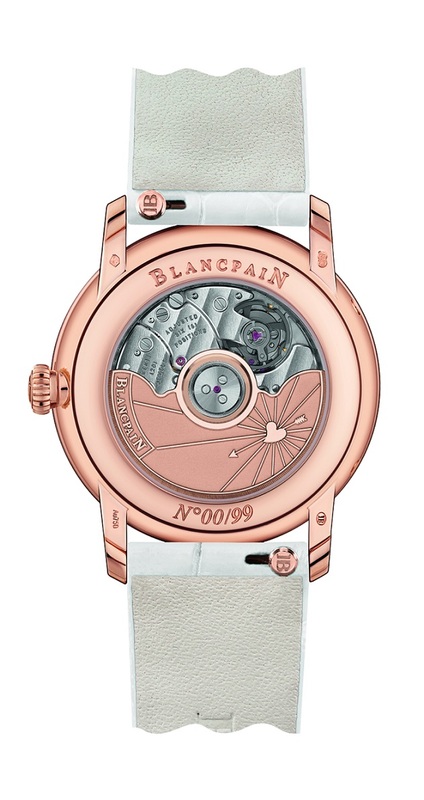 For Valentine’s Day, Blancpain reinterprets its Villeret Women Quantième Phases de Lune watch, delicately blending the collection’s signature characteristics with the universal emblems of love. Stemming from a tradition initiated by the brand in 2001, this 19th limited series intended to celebrate lovers is issued in a 99-piece edition. 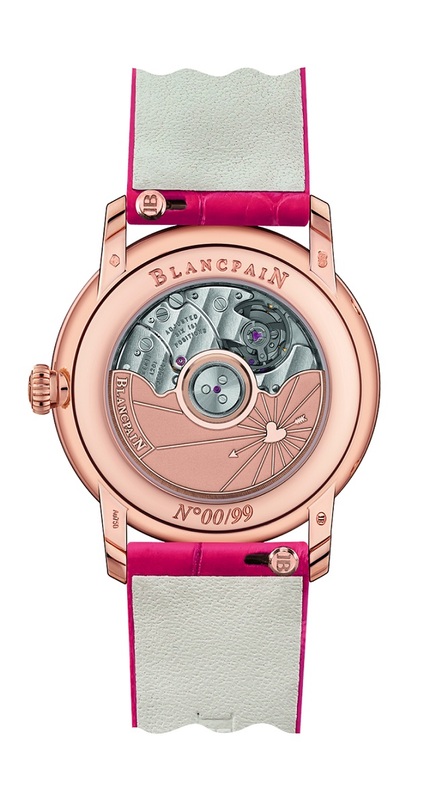 This year, Blancpain once again joins Cupid in devoting its expertise to love. The Maison has dreamed up a refined exterior for its calendar with moon phases, one of the most romantic complications gracing feminine models in its Villeret collection. 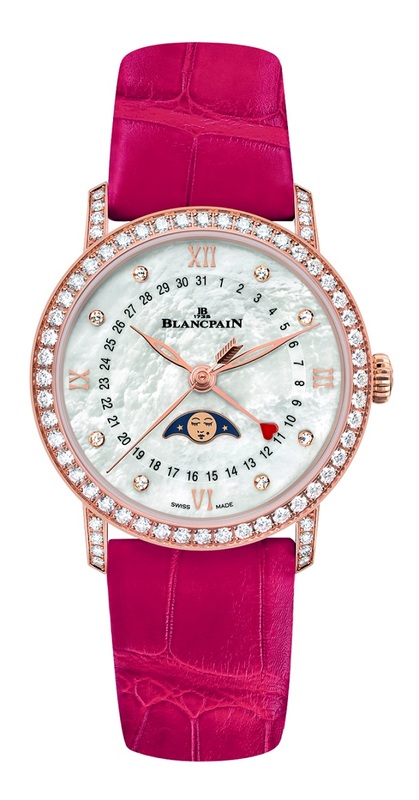 The special “Valentine’s Day 2019” timepiece appears with a natural white mother-of-pearl dial, of which the iridescent sheen and cotton-candy shades evoke a heavenly backdrop. Eight brilliant-cut diamonds serving as hour-markers are carefully set and secured to the mother-of-pearl, whose extreme fragility leaves no room for mistakes. Swept over by slender matching cut-out sage leaf-type hands, the chapter ring is complemented by applied red gold numerals marking 3, 6, 9 and 12 o’clock. The seconds are pointed to by a central hand shaped like a Cupid’s arrow, while a fourth hand tipped with a red-lacquered heart indicates the date. The moon phase appears at 6 o’clock, through an aperture with rounded edges and a golden rim. 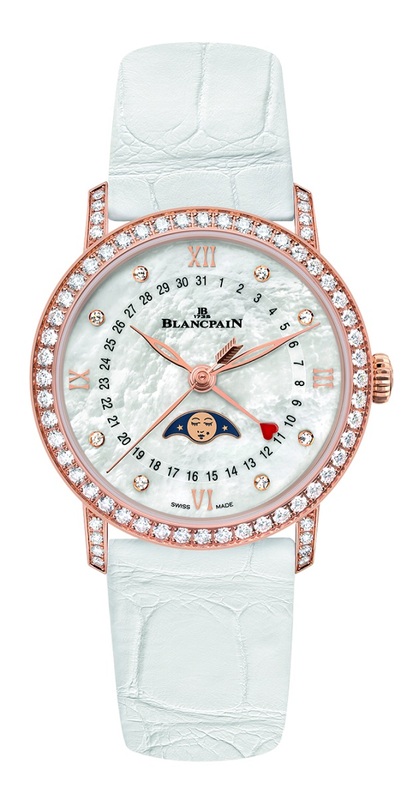 This distinctive depiction of the moon characteristic of Blancpain’s feminine timepieces bears a playful face distinguished by a mouche placed at the corner of its smile. Thus named in French for their resemblance to flies, these artificial moles or ‘beauty patches’ were originally used as decorative elements by the women gracing European courts in the 18th century. The heart of this “Valentine’s Day 2019” special edition – its 913QL.P movement is housed in a 33 mm red gold case set with 64 brilliant-cut diamonds on the bezel and lugs. It is designed to meet women’s highest expectations in the realm of Haute Horlogerie. Endowed with a silicon balance-spring and a 40-hour power reserve, this self-winding movement features flat bridges ensuring a more generous case-back opening and incorporating a broader oscillating weight. Also crafted in red gold, the latter is engraved with the symbols of love. Issued in a series of 99 individually numbered and engraved timepieces, this model is teamed with two interchangeable alligator leather straps. Its lucky owners will thus be able to switch from flaming red to pristine white simply by pressing the functional catches located beneath the straps.